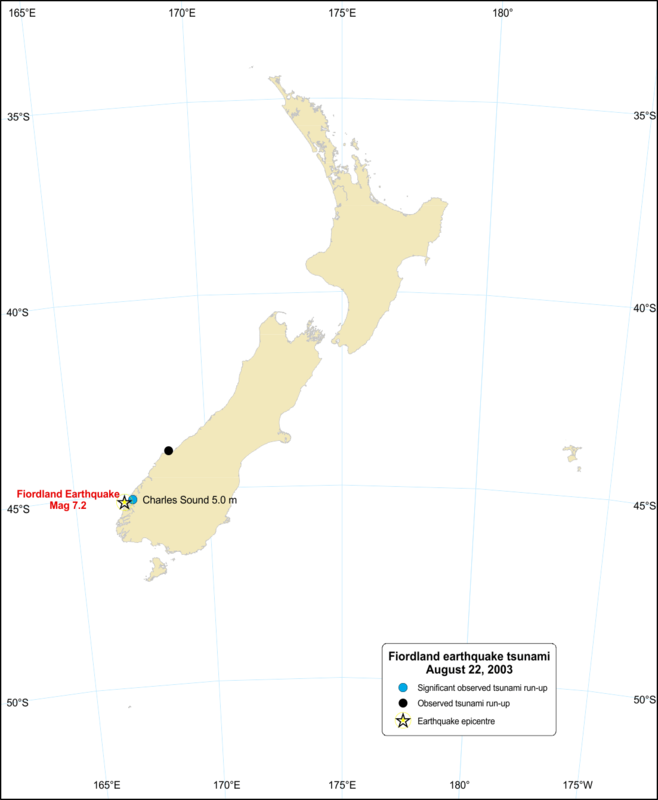 One tsunami was very localised and was generated by an earthquake-triggered sub-aerial landslide that caused run-ups of 4-5m, damaged a wharf and affected several hundreds of metres of shoreline in Charles Sound. The other tsunami, generated by deformation along the Tasman Sea coast, was recorded on tide gauges at Jackson Bay (0.3m peak-to-trough) 190km north-east of the epicentre, and at Port Kembla (0.17m peak-to-trough) on the east coast of Australia. Modelling of this tsunami indicates that tsunami arrival times are compatible with the timing of the mainshock and the wave amplitudes are consistent with the estimated offshore co-seismic deformation (uplift) of close to 0.5m vertically determined by preliminary modelling of post-earthquake GPS data.